Cross-code signing Josh Charnley can play rugby union for England, says Sale Sharks director of rugby Steve Diamond. 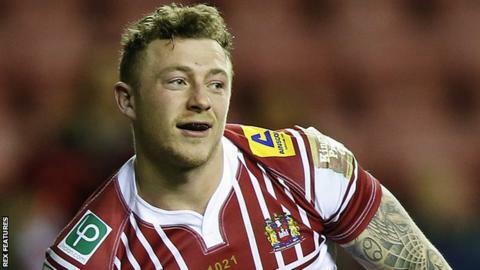 Charnley, who will join Sale from Wigan at the end of the current Super League season, has made seven appearances for England's rugby league side. "His ambition is to play at the highest level and his first obstacle is to get picked here," he told BBC Sport. "If he does that and consistently plays well, then I'm sure the new England set-up will look at players like him." Diamond continued: "We're getting an established international finisher. His strike rate is one try a game over 150 games, which is unbelievable. "He'll fit in well. If he doesn't make it after a year or two, then he could always go back and be a top-class rugby league player." Jason Robinson made a successful transition when he crossed codes to play for Sale in 2000, after making 302 appearances for Wigan in rugby league. Robinson played for England in their loss to Australia in the rugby league World Cup final in 1995, but later won the rugby union World Cup with England against Australia in 2003. He earned 51 England caps in rugby union, as well as featuring five times for the British & Irish Lions, while at club level he captained the Sharks to a Premiership title in 2006. "Nobody can compare anybody to Jason, but Josh comes with a fantastic try-scoring record and he's an unbelievable goal-kicker," said Diamond. "He comes with the things we are looking for. We haven't had to break the bank, the money is the right money. It's all about ambition. "He's got to get that switch in his brain, but we've done it with rugby league players before and we did it with Jason." Following Sam Burgess' short-lived and unsuccessful switch from league to union, Diamond is planning to play Charnley at full-back and on the wing - both positions that the 24-year-old has filled in rugby league with Wigan. "He's got a bit of work to do on the conversion to playing rugby union," Diamond added. "If he can work hard and make the transition, then we've got a gem on our hands. "He's got a full skill set, we know he kicks goals but we'll not go down the path that other rugby union teams have done and try to play them in different positions. "What happened with Sam was nothing short of a disgrace. He was played in one position by England and another by his club, you just can't do that."